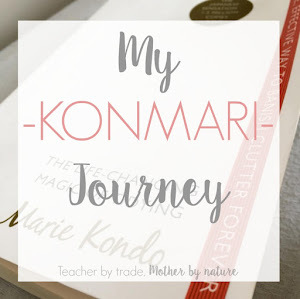 If you have just joined me - WELCOME - I recently completed the KonMari method with my OWN belongings, read 'My KonMari Journey' to see how I did. Now, it's time to get stuck into my kid's stuff - I have two children: Miss B, 12 years old and Master M, 3 years old. 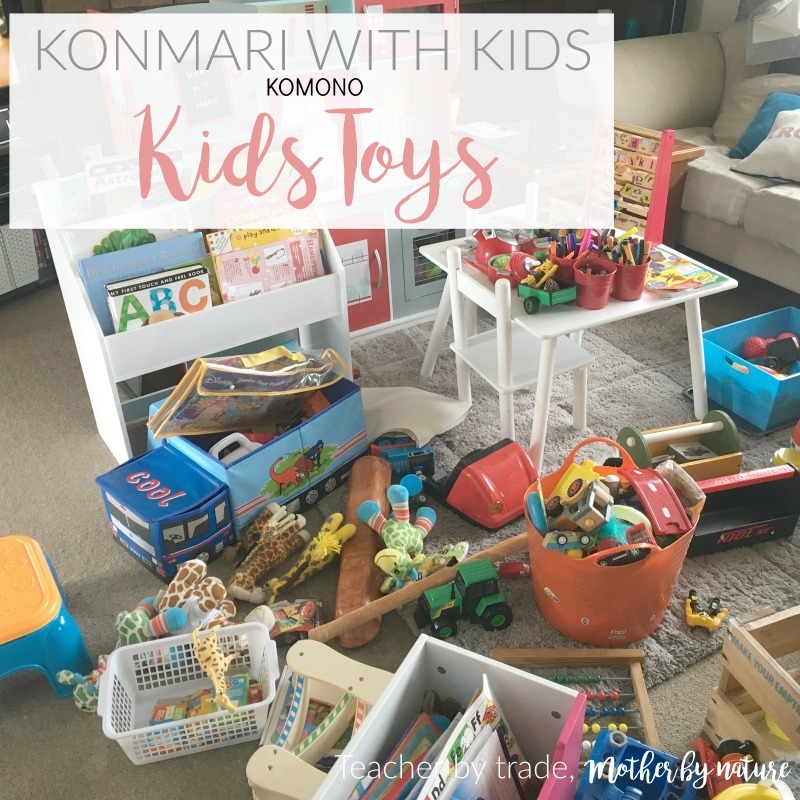 Previously on the blog, I shared how I KonMari'd my kids clothes (Baby, Toddler and Tween), their books., Paper - including Art Work and School Memorabilia, and now it's time for KOMONO (miscellaneous items). 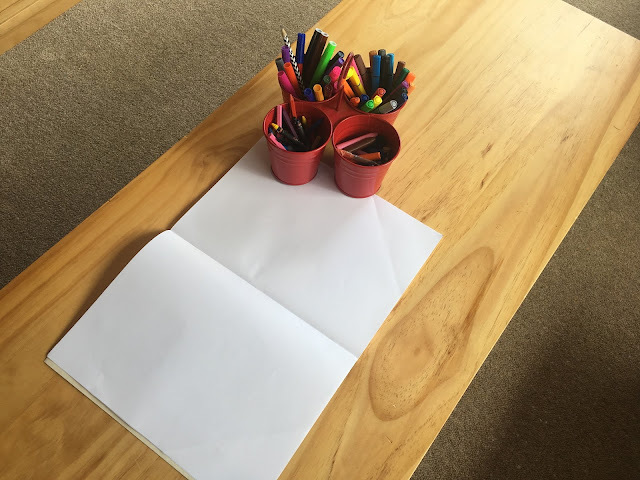 In Kondo's second book, Spark Joy, she mentions that "The key to fast and efficient komono tidying is to know your categories". 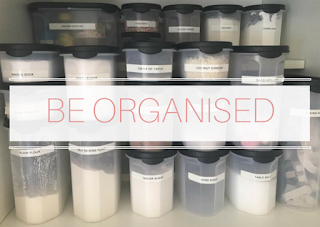 Once you have identified the categories that exist in your home, you can follow the three basic steps for each one. 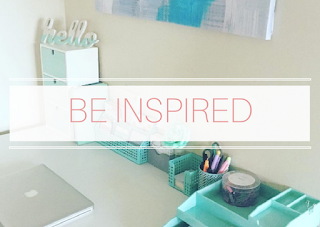 Gather all items in that category in one place. 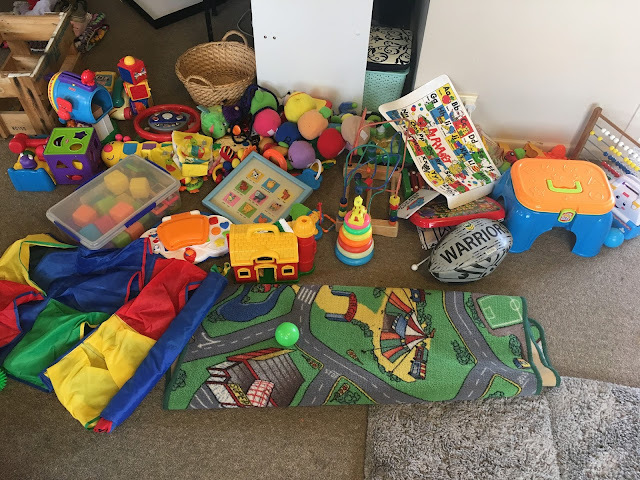 This is what our playroom looked like a few months ago...it quickly became a dumping ground, and it was doing my head in...I knew something had to change! 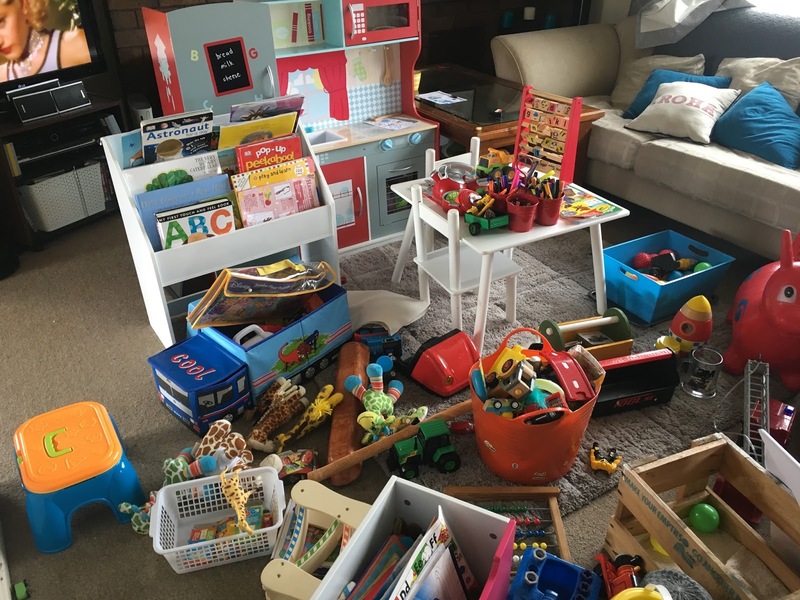 We also had a buffet side table in our dining/living area filled with kids toys etc...so it felt like toys were all over the place. 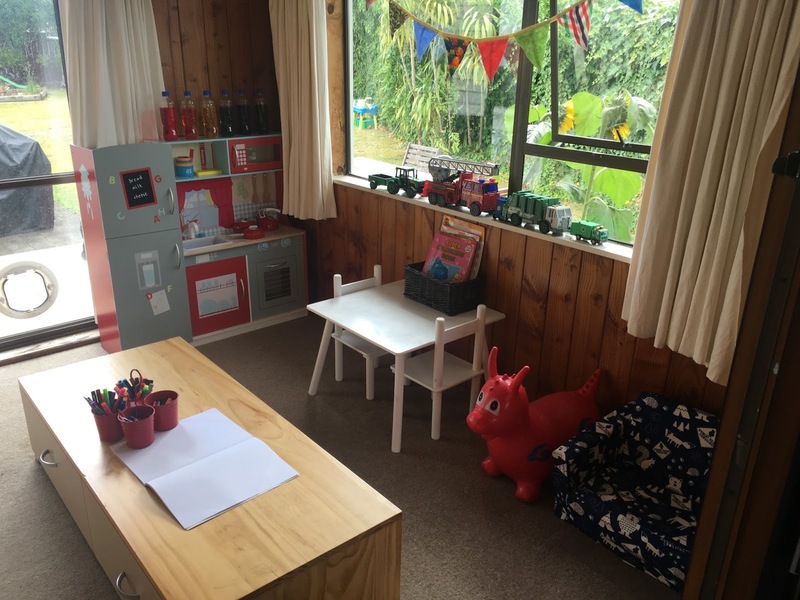 I had a vision for our playroom, and this wasn't it. 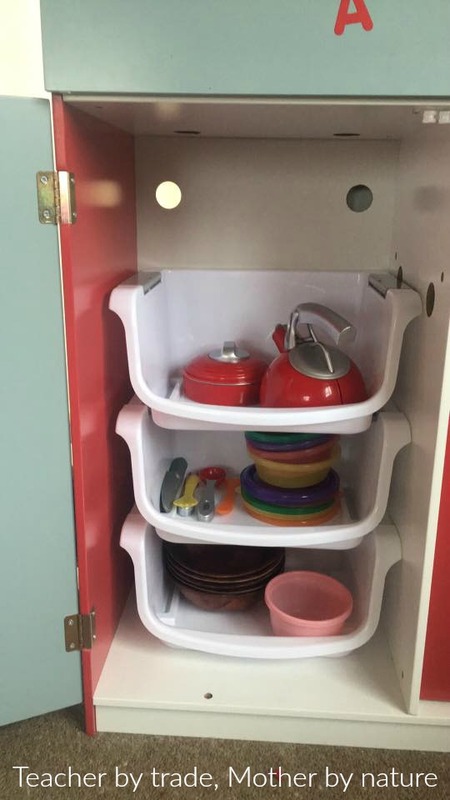 There was too much 'STUFF'! 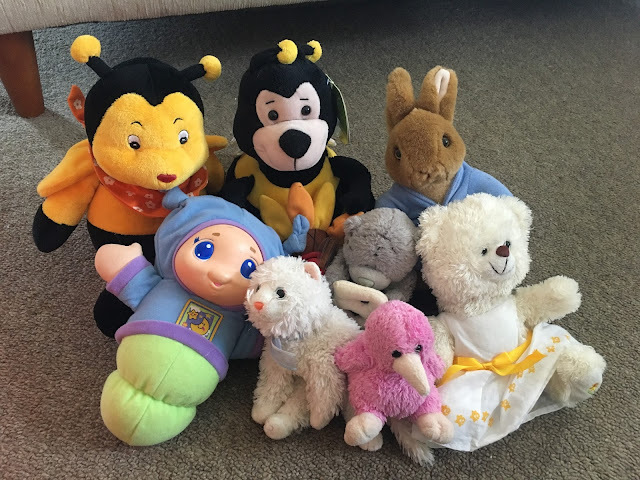 Most toys didn't have a HOME and ended up stuffed in tubs, boxes or dumped on surfaces. The first step is to "gather all items in that category in one place," and that's exactly what I did. I pulled EVERYTHING out of the playroom and the kids bedrooms, and brought them into the lounge. Oh my!! I stepped back and just gasped! ALL of this was in the playroom (and a few things were in the kids bedrooms)...I kept thinking...HOW DID IT ALL FIT? 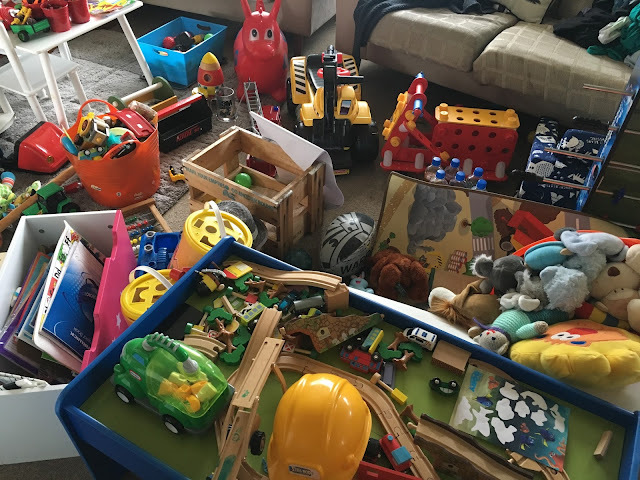 The thing I love about the KonMari method and following Marie Kondo's principles is that by gathering everything in one place, you can see the full volume of your belongings, in this case...your kids belongings. WOAH! 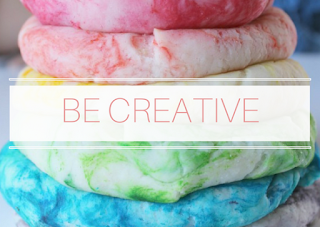 I had a blank canvas to work with, and I was excited about this. 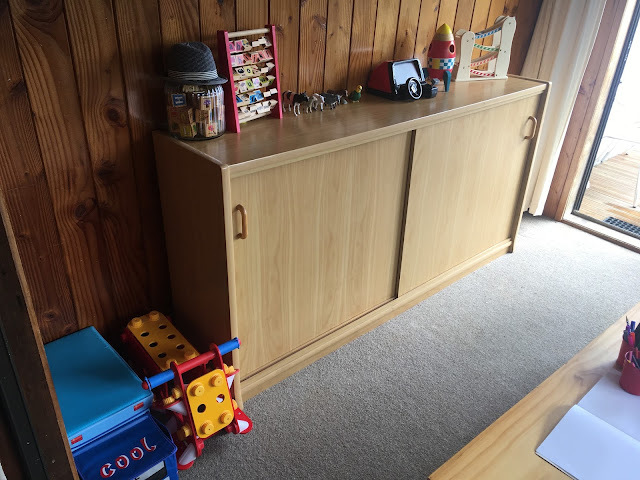 The two drawer shelf unit pictured below used to be a part of my son's wardrobe unit, that I pulled down. 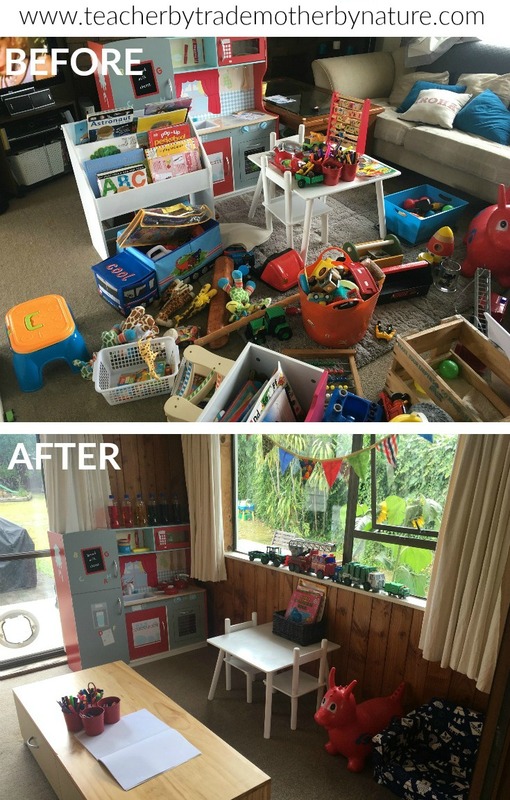 We did consider selling it, however it has become a great surface and storage space for the playroom - it sparked joy in the playroom, so it's here to stay (for now). The next step is "choose only those that spark joy". Because this is all about the KIDS...it's at this step where you need to have your children's input. 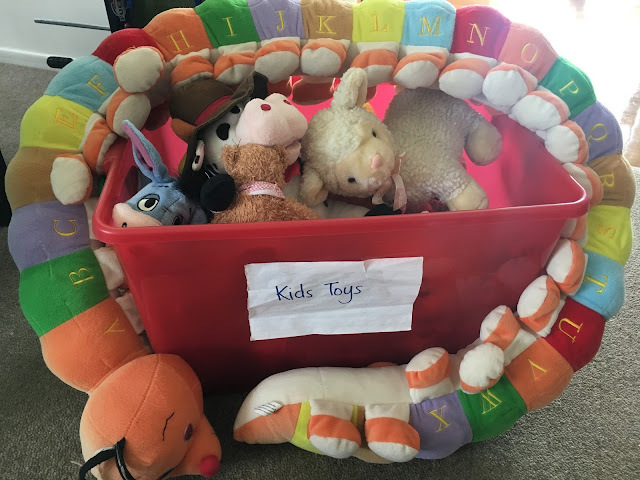 Now I know it would be so much easier to do this without the kids, but at the end of the day, it's their toys and they need to be a part of this process. 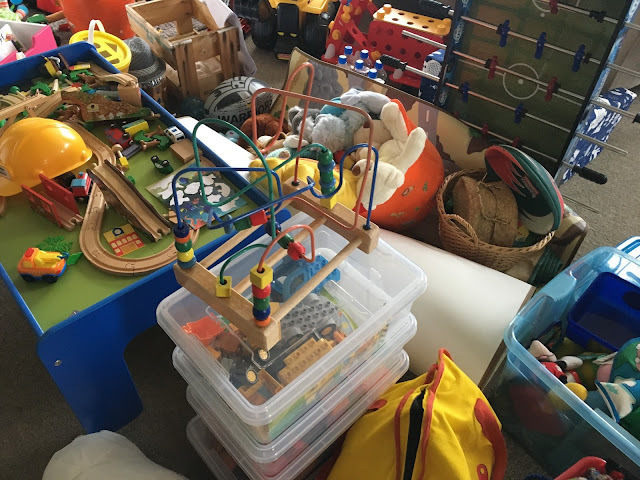 Marie Kondo mentions that children 3 years and over are more than capable of making decisions and deciding what sparks joy for them, so I put it to the test with my three year old. 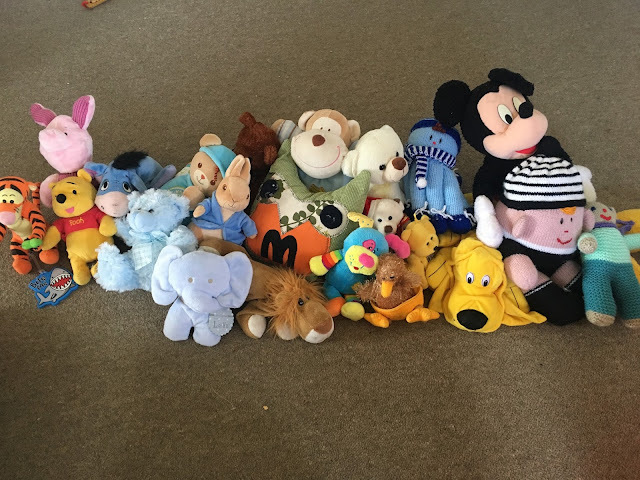 I was pleasantly surprised that there were toys he didn't like, want or made him happy, so they went straight into the donate pile. 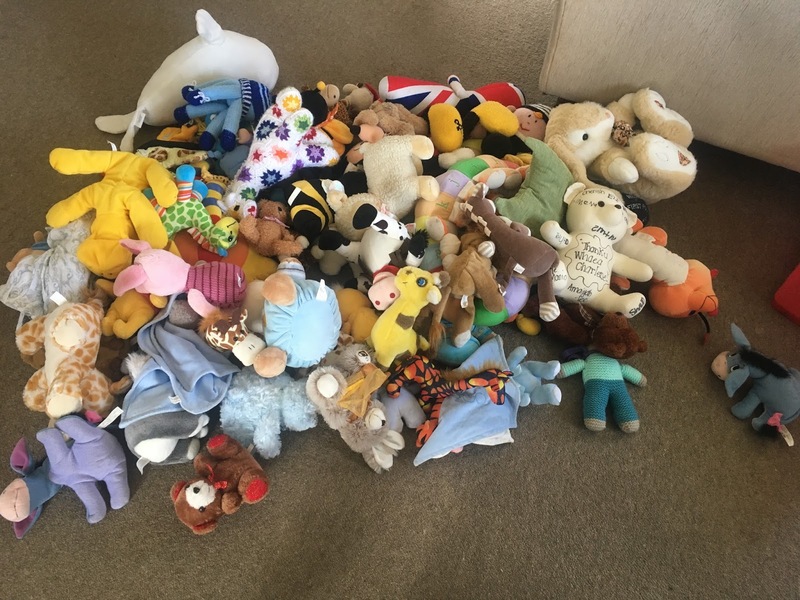 There were toys he hadn't seen for ages, probably because they were hidden away, however they sparked joy again and so we kept them. The donate pile was getting bigger and bigger and I could see what toys actually made my son happy, and he would play with on a daily basis. It took us a few hours to complete, but we got there in the end...and I LOVE our new playroom, so does my son! It appears and feels less cluttered. Everything has a place and I am implementing new systems so that it doesn't get out of control. Everything has been moved around to allow better flow and create 'areas of play'. 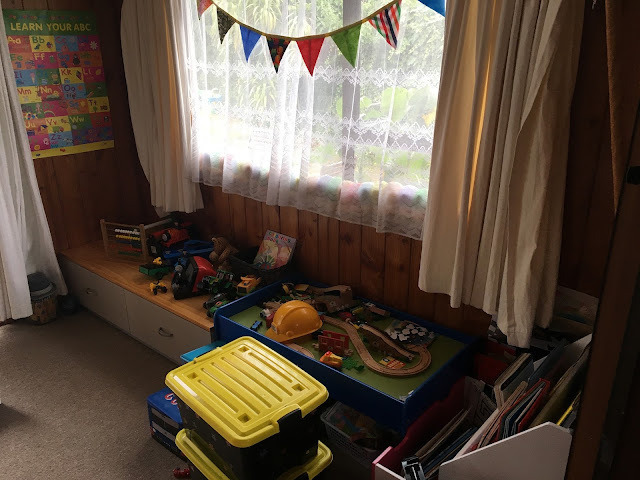 I moved the buffet side table into the playroom, as it provides great storage and a surface to display items. (When we moved into our house, this is where it was, but I moved it out to create more room, however this shelf unit is perfect for the playroom, because at the end of the day we can shut the side doors. 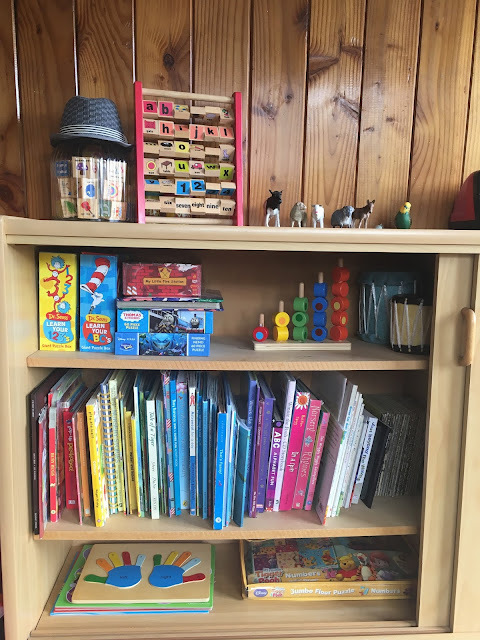 On the left side of the side table unit we have puzzles and books - the 'quiet' toys. I absolutely LOVE the books arranged by colour - not only does it look good, but its easier for Master M to return books to the shelf once he's finished reading them. 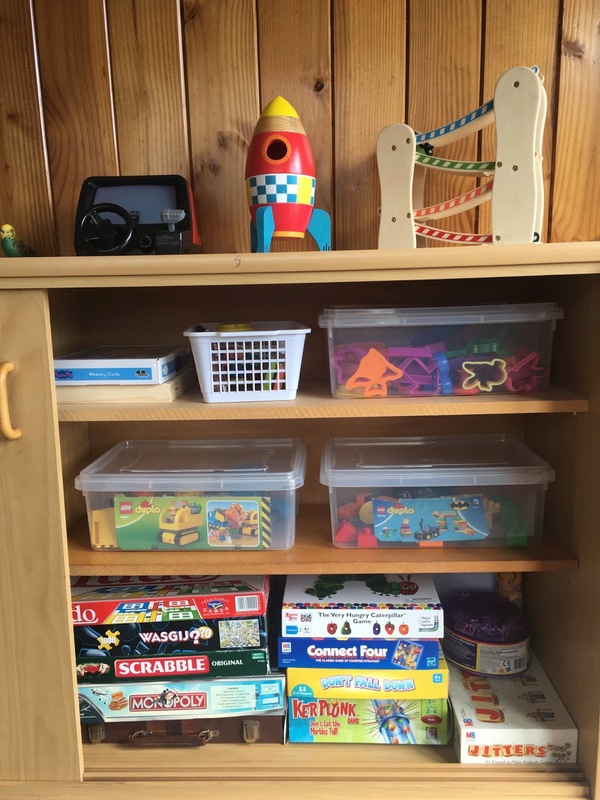 On the right side of the unit, we have cards, magnetic game, play dough toys, Duplo, Dinosaurs, and on the bottom shelf is where we store the board games. I had a clean out of the board games and only kept the ones we absolutely love playing. 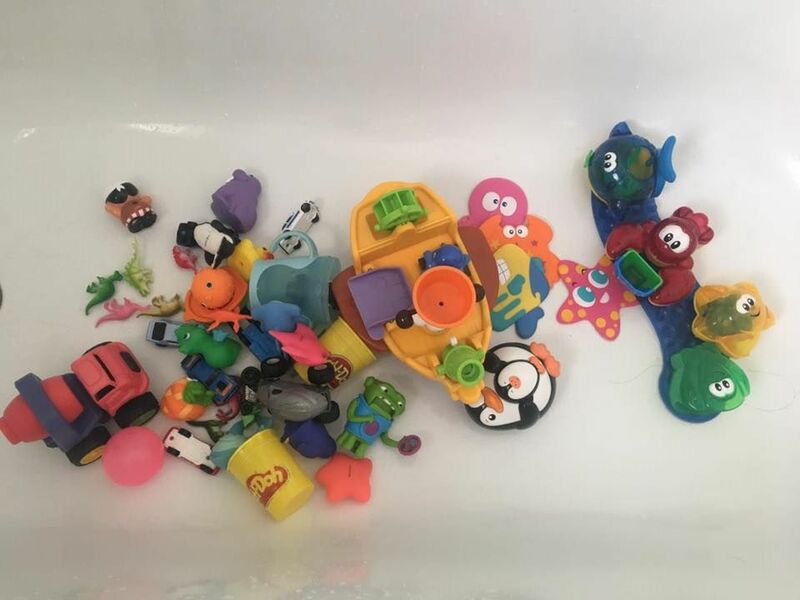 The play dough toys, Duplo and Dinosaurs are stored in clear containers I purchased from The Warehouse earlier this year. (I tried to find a link to the product online, but can't find one). 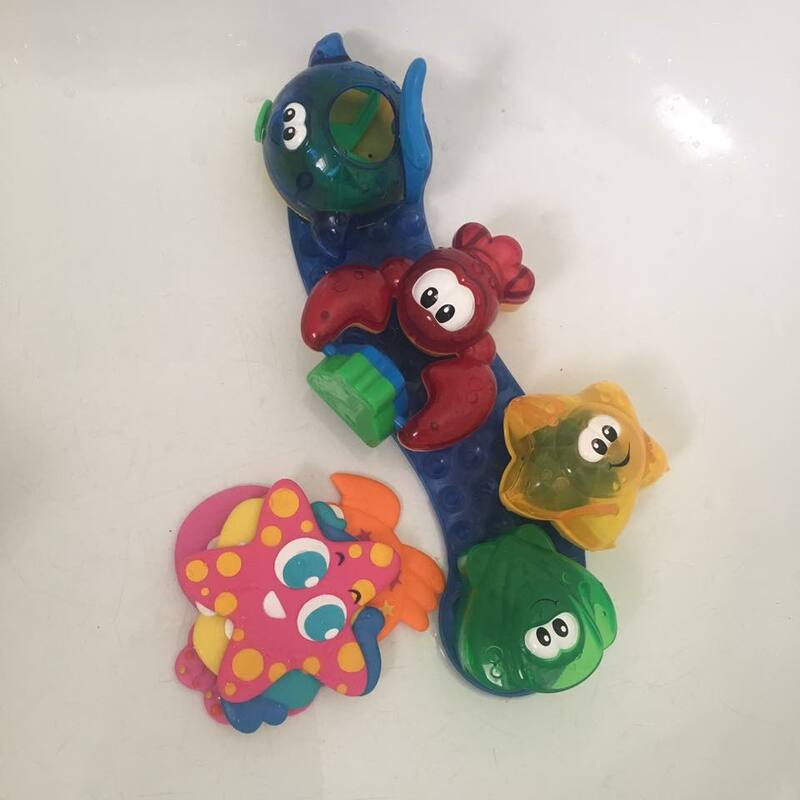 They are the perfect size, and the thing I like most about them is that it provides a limit to what we can store in them. 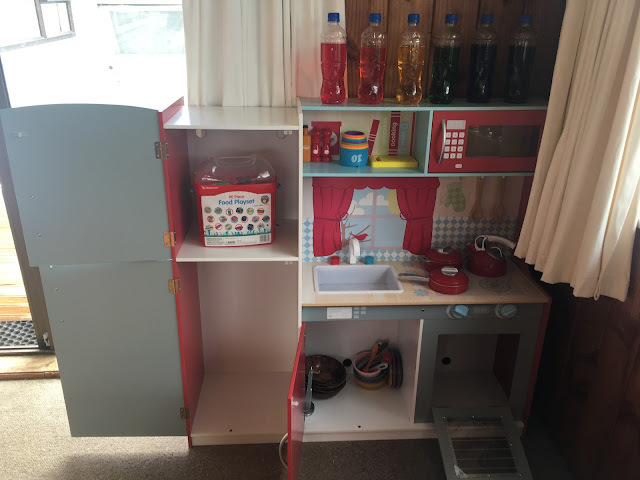 We bought this kitchen (from KMart) for Master M's 2nd Birthday, and he loves it! He plays with it daily. We have a few kitchen-related items he can use during play - he does enjoy making lunch for Mum. 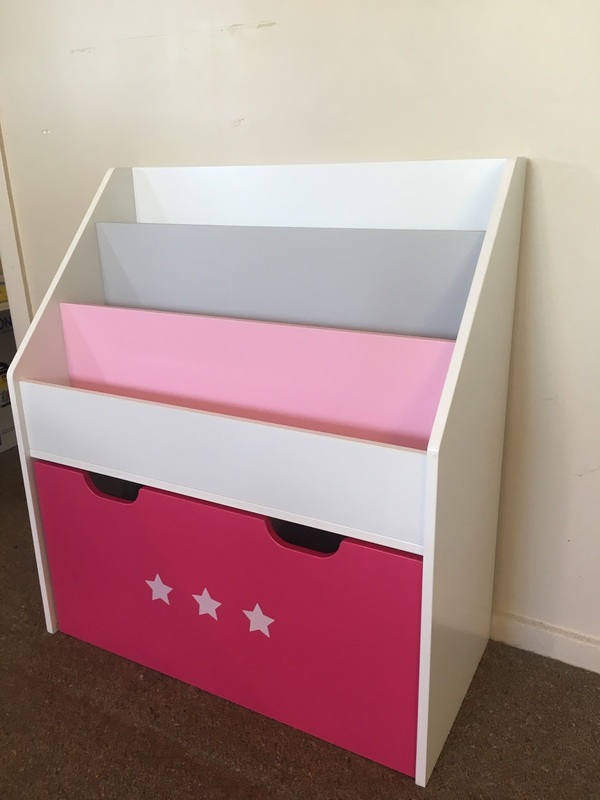 I love these '3 stacking bins' from KMart - they are a perfect fit for the KMart Play Kitchen. 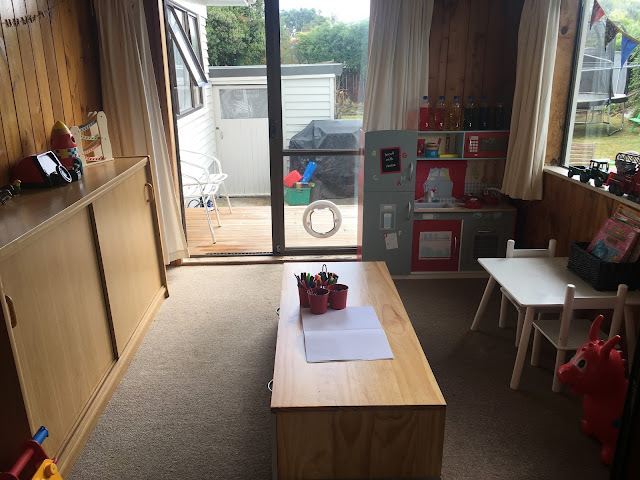 Master M enjoys writing and drawing, so this low shelf in the middle of the playroom works really well. It's a good height for him to sit down or kneel on the floor and get creative. He also has the option of drawing/writing at the kids table. 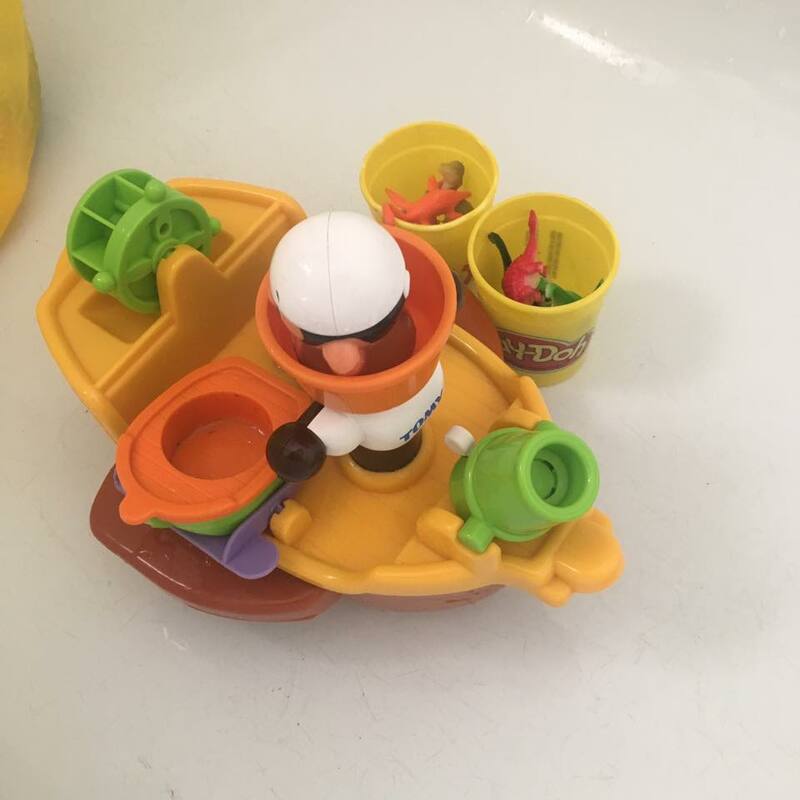 I keep the supply of crayons, and markers (felt pens) in this 4-bucket caddy (from KMart), it has a little handle on it, so he can move it around to where ever he wants to draw etc. Our boy loves his cars, trucks, construction vehicles and trains. 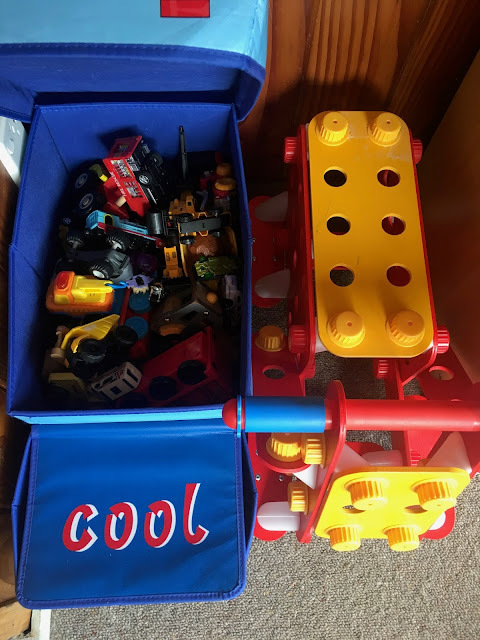 I used to have, what I thought, was an awesome storage solution for his cars etc - it was a 9-box storage shelf...however every single day, he would tip them all out, just for the sake of it...so I took it out of the playroom...discarded the boxes and up-cycled the shelf as a shoe organiser by our front door. WIN WIN! So now, all the vehicles are stored in this awesome 'truck' box. 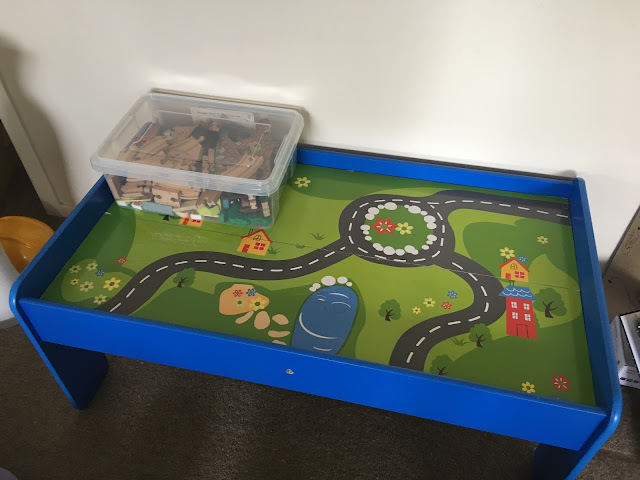 The train table is one of the only toys I have on rotation. 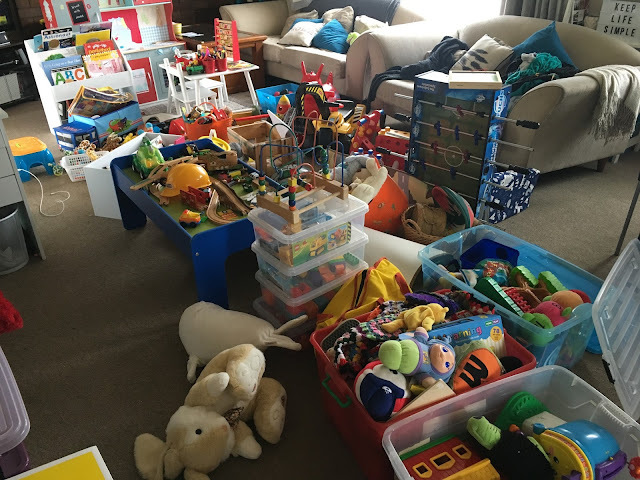 It's usually stored in Master M's bedroom and then moved out to the empty space (where the side table was) in the living/dining area, when we have playdates or if Master M wants to play with it. When he's finished playing with it, I take it back to his room. It's light and easy to move, hence why it's on rotation. As soon as I was finished, I put everything that was needing to be donated straight into the car and dropped it off. 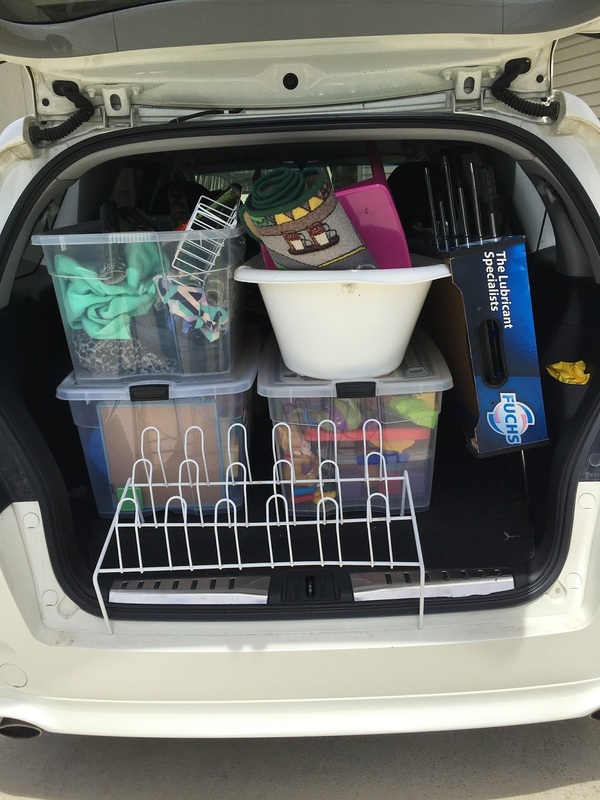 It was such a relief to have all of this stuff no longer in my home! 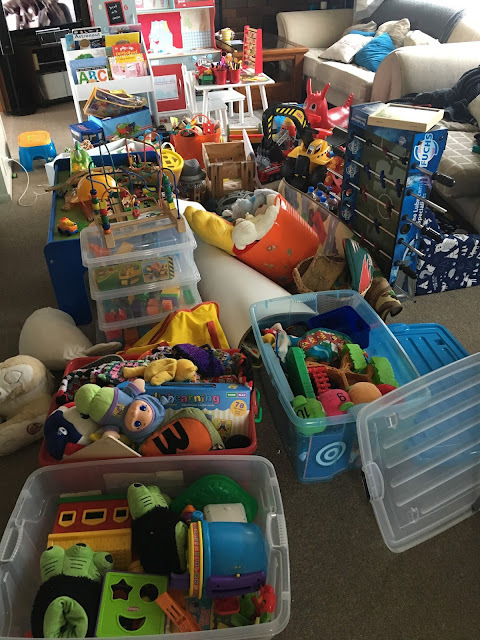 Probably 4x 60L containers worth of toys, and a few extra bits and pieces from around our home that no longer sparked joy - all ready to find a new home. Sadly, one of the things that no longer sparked joy for me, was this library bookshelf. I did love it, however it was no longer needed, and it was just taking up space...so I gave it to my friend, who has two little girls. 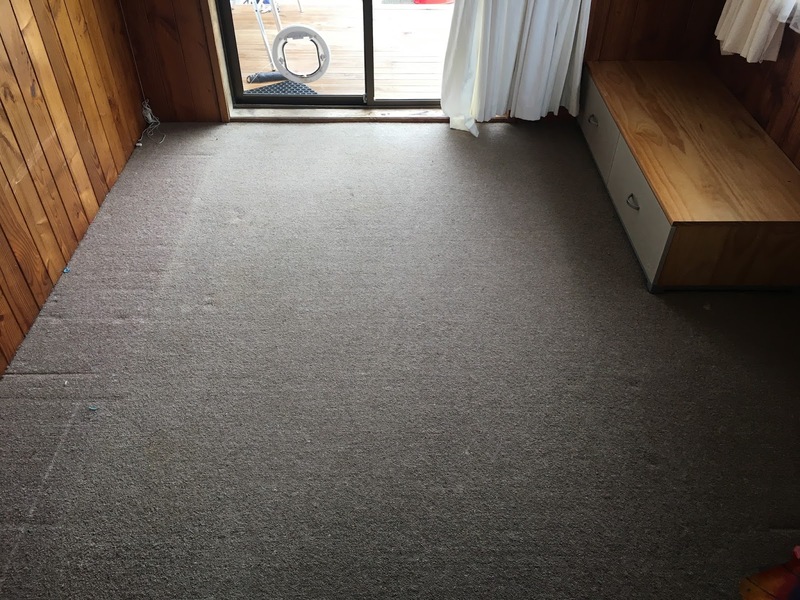 They absolutely love it and I am glad it has gone to another family who will appreciate it more than we did. WOOHOO!! I can finally tick TOYS off my list - what a great feeling! 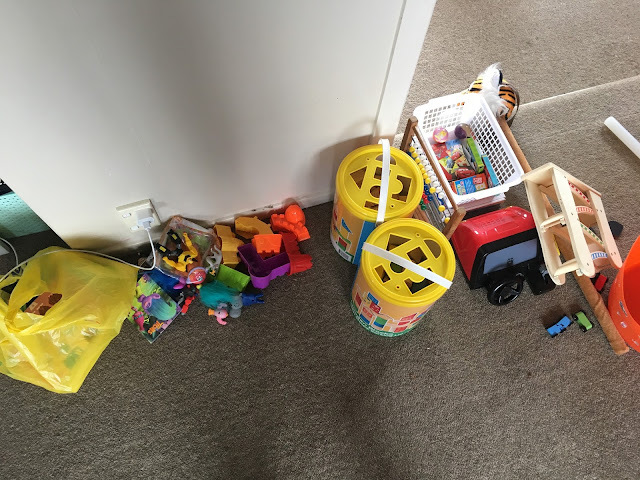 This was a huge task, however I am so glad I used this method to declutter the kids toys. 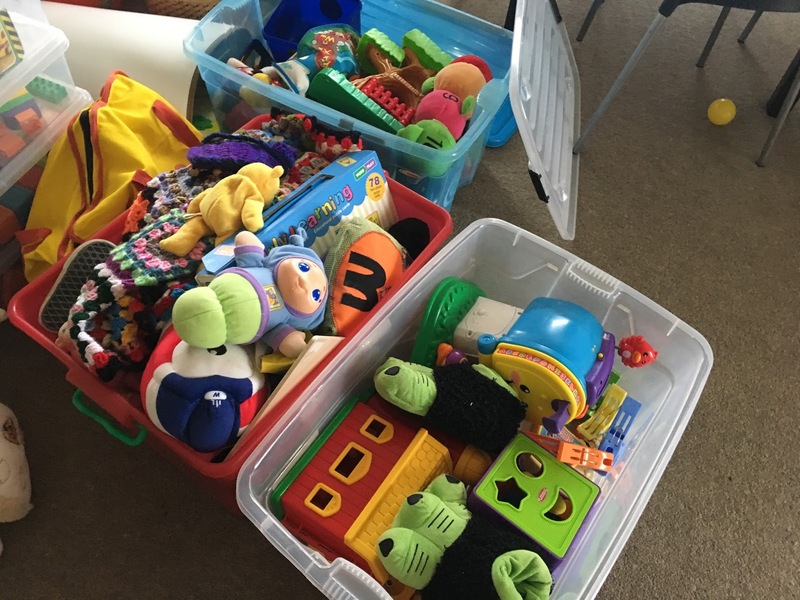 These three basic steps definitely helped me and I know they will help you if you are thinking about decluttering your kids toys. 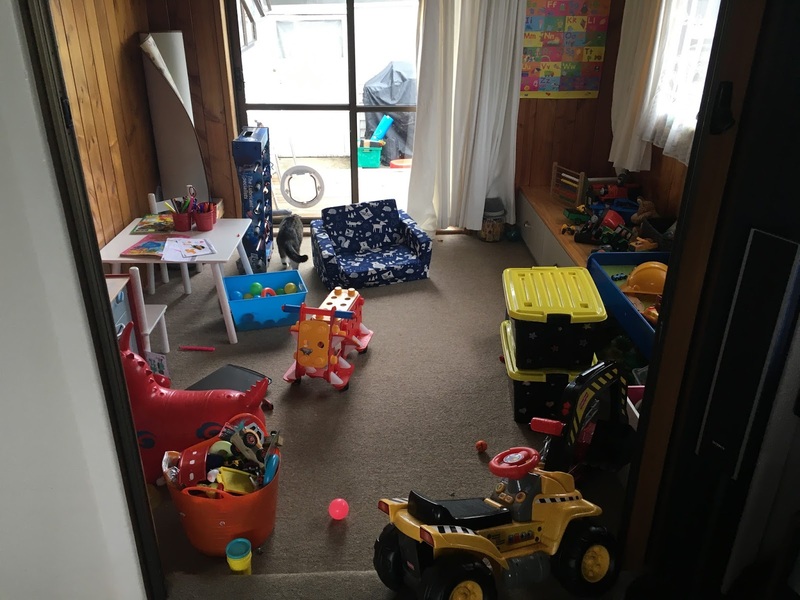 My son loves his playroom, and loves each and every toy that is in there now, and knows where everything goes. 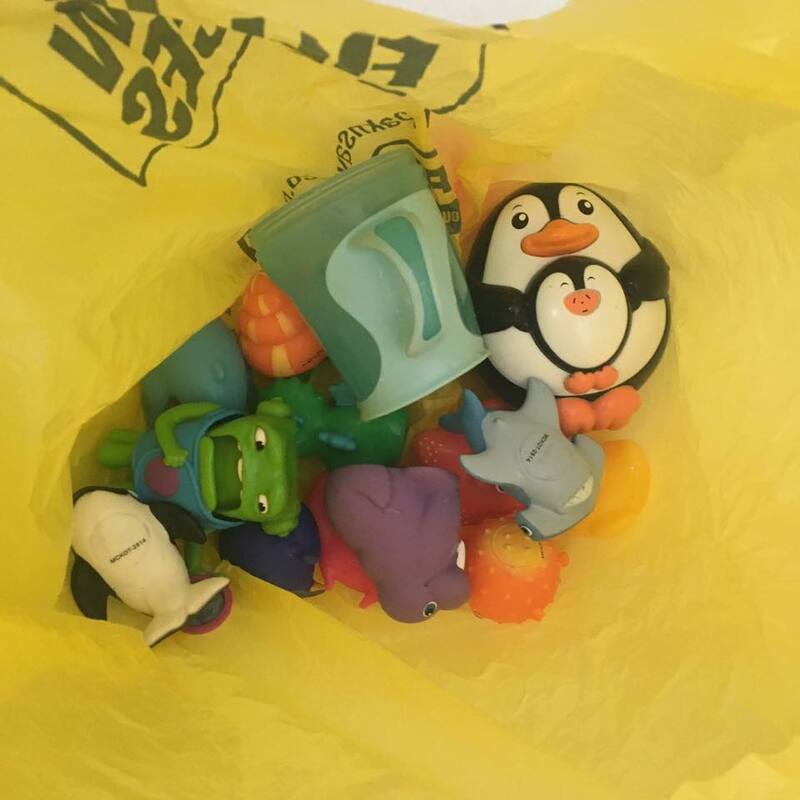 He does mix things up and that's okay because each week we sit down and re-sort his toys, returning items to their place. My son takes pride in his 'playroom', and enjoys helping Mummy tidy up. 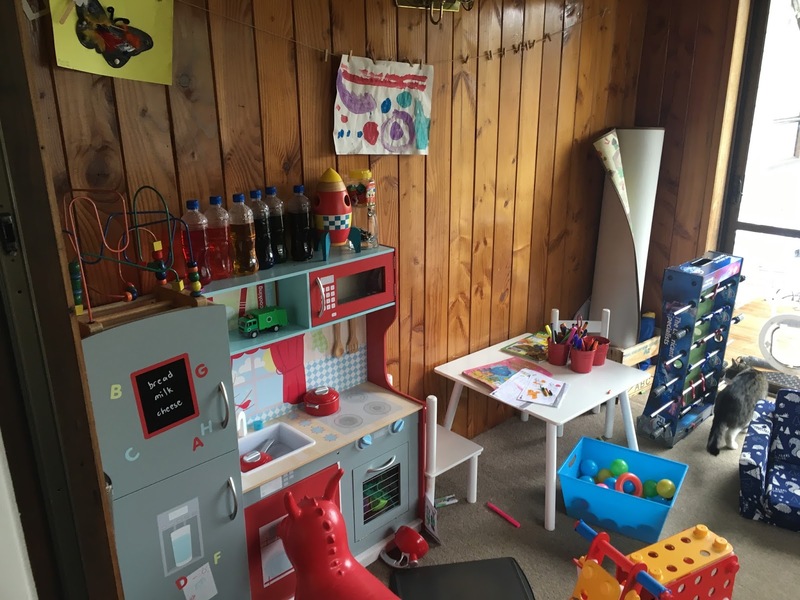 The Playroom not only sparks joy for him - it sparks joy for me too. 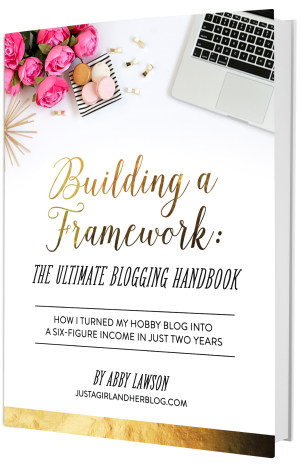 I hope you found this post helpful. If you did, please feel free to PIN and/or SHARE with your friends and family. 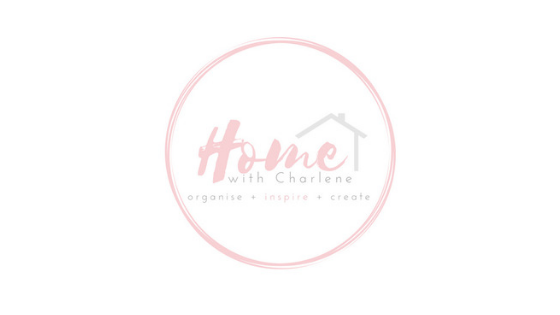 I am super excited about this new series 'KonMari With Kids' and would love for you to follow along in this process, better yet, join me - Subscribe to my Blog, so you don't miss a post and together we CAN 'KonMari With Kids'. 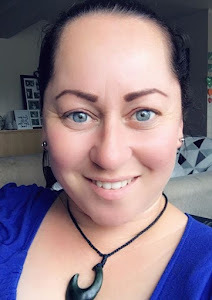 I will also be sharing my journey on my Facebook page, and Instagram, so be sure to follow me there too. What a transformation! I love that you got your kids involved. 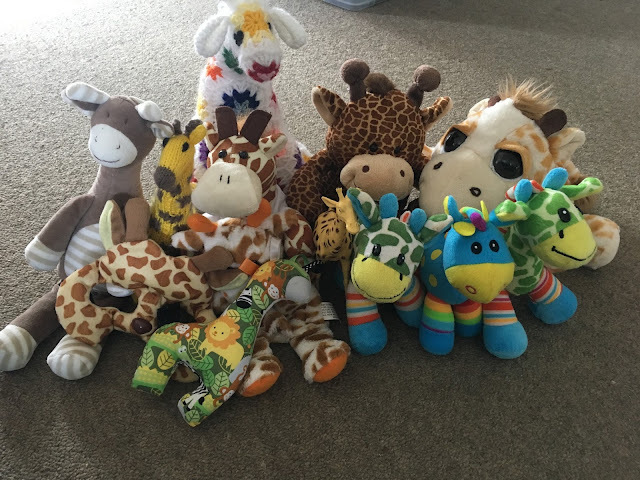 Our friends have a policy of 1 in and 1 out with toys and actively encourage their kids to donate toys that they no longer love or play with. There is definitely too much of a good thing. I love how the whole family is in on the Kon Mari action. I think it's really important that the kids are involved in the process. It's all about their joy, not mine. I love this! i have searched high and low for a kids konmari blog to get some idea of how mums managed it - and yours is the first i love! well done! Its our mission for today! Awesome! Thanks Kirsty! 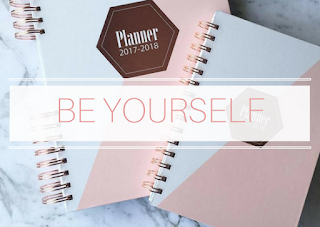 Glad my posts have inspired you to start! Keep me posted!